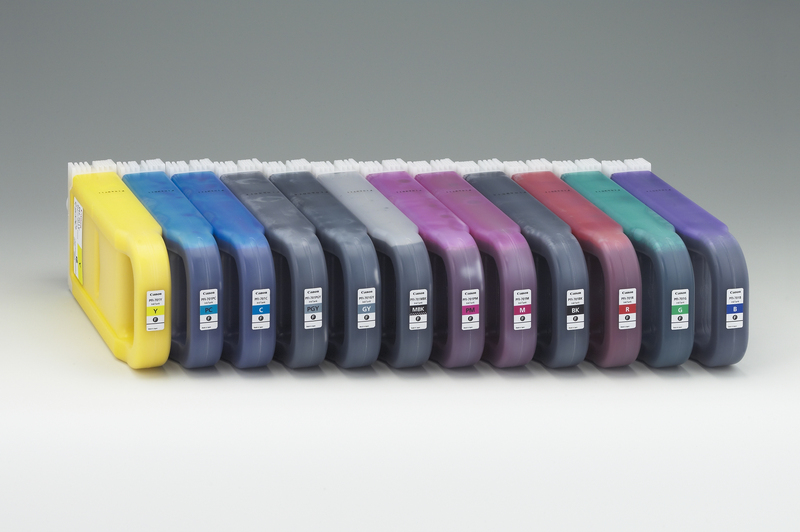 The iPF9000 printer features a new 12-color pigment ink system featuring Red, Blue, Green, Gray, Photo Gray, Cyan, Photo Cyan, Magenta, Photo Magenta, Yellow, Regular Black, and Matte Black. The large color gamut provided by the 12 inks produces brilliant colors. The addition of gray and photo gray helps to create smooth gradations and less graininess, creating a crisp monotone output. The iPF9000 will automatically switch between Regular Black and Matte Black at the time of printing. Simply choose the paper type and the iPF9000 will use the appropriate black to optimize print quality. The Regular Black ink produces high quality prints on photo glossy type media and the Matte Black ink exhibits high contrast prints with deep black on media such as fine art paper. Engineered for speed and advanced image production, the iPF9000 boasts Canon's dual print head system to lay down ink with unprecedented speed and accuracy. Unlike conventional printers with a single print head, the iPF9000 uses two high-precision, high-density print heads with a total of 30,720 nozzles. 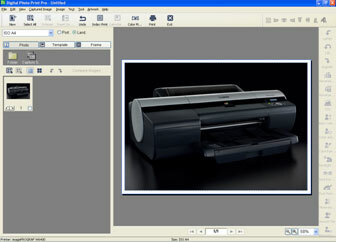 It lays down precise 4pl ink droplets to produce sharp detail and excellent image quality. The superfine 4pl droplets produce delicate color gradations and high-definition. The twin lines of nozzles on the new print heads enable the iPF9000 to minimize the number of printing passes and still maintain print quality. Each of the 2 print heads contain 6 colors, for a total of 12, each employing 2,560 nozzles for a grand total of 30,720 nozzles. This print head technology enables the iPF9000 to print at a true 1200 dot pitch with remarkable speed. This image editing and layout software is designed to easily edit and output large-format prints from images captured with a digital camera. For novice photo software users, DPPP simplifies advanced functions such as red-eye correction, dust removal, skin tone improvement and many other features. Furthermore, you can layout images in a variety of ways using the templates provided within the application. For Adobe Photoshop users, DPPP is capable of 2-way communication to enable the quick exchange of image files between the two programs. Avoid inaccurate prints by utilizing the Soft Proof function, which provides the ability to view the actual output colors in advance on the monitor, and the Real Preview function which confirms in advance how many images will be laid out on roll paper.